Older Americans in Mexico: where do they live? A BBVA-Bancomer report, based on Mexico’s 2010 census data includes an interesting graph showing where “Americans older than 50” live in Mexico. The data is based on place of birth, so some of the “Americans” in the data are of Mexican heritage – they were born in the USA, to parents who were born in Mexico, and have since relocated to Mexico. As the graph highlights, almost half of all Americans living in Mexico live in one of just 20 municipalities. 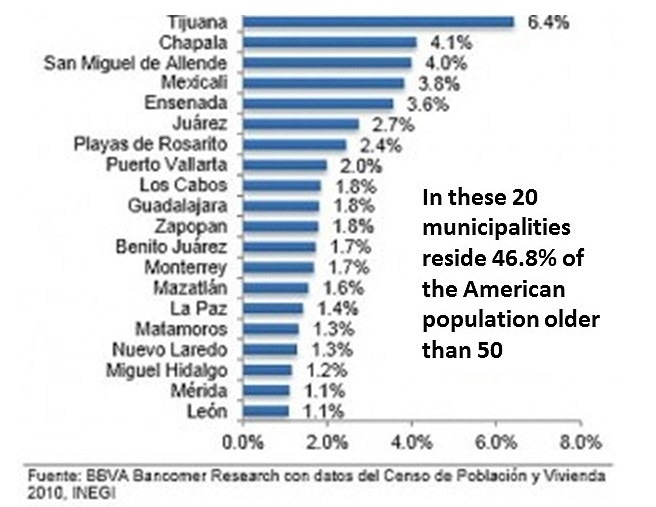 Tijuana, just across the border from San Diego, leads the way, with 6.4% of all the Americans over age 50 living in Mexico, followed by Chapala and San Miguel de Allende, the only two non-border municipalities in the top seven locations for older Americans. Perhaps no surprise, then, that both these areas have weekly English-language newspapers. The Chapala area is served by The Guadalajara Reporter which covers Guadalajara, Zapopan, Chapala and (to a lesser extent) Puerto Vallarta, potentially reaching 9.7% of all Americans over the age of 50 in Mexico. For its part, San Miguel de Allende has Atención San Miguel. Both locations are popular choices for retirement. How many foreigners live in Mexico? Puerto Vallarta also is home to two English Language papers the PV Mirror and the Vallarta Tribune. Mexico City produces the paper The News which is distributed around Mexico and Playa del Carmen has a newspaper called the Playa Times. The quality of all these papers varies dramatically but none the less they are there. I find it odd that the Riviera Maya area and Mexico City don’t fall in the top 20 cities. Thanks! The additional information is much appreciated. Apart from Chapala and San Miguel de Allende I cannot imagine Americans not born in Mexico or with family in Mexico living in most of those other places. I think we are looking at returning Mexican retirees. I cannot imagine a worse newspaper than The News. It reads like some failed attempt at government propaganda that has just wandered further and further from it’s founding dull spark and only exists because it receives a monthly cheque by default. Yes, The News has certainly had quite the publishing history and is a shadow of its former self. Back in the 1980s it boasted several of the most highly respected columnists in the country, but politics and (eventually) competition from online news have taken their toll. The sheer size of Mexico (and resultant travel times) has always made it difficult for national newspapers to achieve as much as they hoped beyond the confines of the Valley of Mexico. Shannon, There are several websites devoted mainly to those wanting to move to Mexico. The grand-daddy of them all is Mexconnect.com which has been around since 1996, but there are also many other sites, usually with some regional slant, such as http://www.yucatanliving.com/ The forums associated with such sites are the best places to begin exploring the regulations, options and alternatives. Actually Zapopan and Guadalajara are the same metro area. So that should be nearer to the top. Yes, the data are based on municipalities, not urban areas. The figure for the entire metropolitan area of Guadalajara, which includes several other municipalities as well as Guadalajara and Zapopan) – see http://geo-mexico.com/?p=3395 for map of boundaries – would be up there with San Miguel de Allende and Chapala.